Last edited by Plasmo on Wed Nov 21, 2018 9:01 pm, edited 152 times in total. i want to join the scoreboard soon. Finally beat my old score! i am also thinking of cutting each table down to a maximum of 25 available places (possible 10 places for the tables that don't get much action, for the time being). i wont be doing it for a while yet, so please post if you have any objections, ie "yay" or a "nay"
Nay....! I don't think I can ever reach top 25...! New score, but did not get as far as the last run. Still trying out different ship types but maybe I will stick to Type A after all. as a novice i suggest you using type D, because it is the most comfortable to get into. Try learning all basics strats with D, then try out differet types to compare which is the most suitable for you. yay to 25 then my score will be cutoff !! I'm new here and this is time to post my scores. and anyone knows where is Icarus ? in this case I'd prefer a 25 tables board because my current score would be qualified for that, too. it would be top 25. you're saying yes to that idea? I may try Type D later tonight but I don't like the bomb. it will take you 15mins to beat the score, just be sure you know all keyparts in stage 2 (silos, tanks etc) and try to screw up the medal counter in stage 1 as early as possible. I still have a hard time with stage 2 but if things go well i end up there with 4.5 mio or so? I say nay to the cut off. Nice score. Might help fuel some sort of East versus West Canadian challenge. Although, I barely have much time these days so I might not put much of a fight for the crown. I hope this is a joke. ELF would be last, and I'd be off the charts. Not cool. A top 3O is a good idea. But I think it's possible to compile Bond & Dyne results and preserve the top 50. I explain : Bond & Dyne are different (bond is fast, Dyne have a wide shot etc...) but Bond type A & Bond type D are not the same thing too (bombas are different ; speed is different). Moreover the ship and subtype are already specified in score's format. 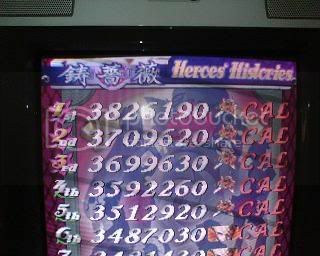 So we have 3 Tables : Arcade Normal (top50 or 40 or 30 ) / Arcade Harder (top10) / Arrange (top25). This is just my opinion. Maybe is a bad proposition because the previous score table isn't like that. We had a compiled Bond/Dyne scorebaord before but since the subtypes dont differ as much as the characters itself do, we should definitely let it seperated as it is. Arcadia does the same thing btw. And top 30/25 is ok imo. For now, I have to play more in arcade mode. It's a very different game. And I've played in that mode just around twenty. Moreover the bullet's colour isn't a problem for me because I allways play with normal colour even in arrange mode. Like that, Ibara is magnificent. Arrange mode is fun, definitely a very good game. anyone else with a view on cutting tables down to 25/30 places?